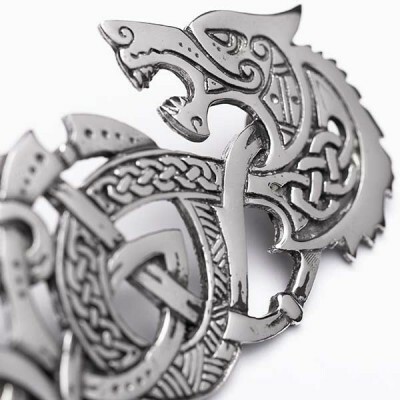 Carved with the highest attention to detail, USA Kilts is pleased to introduce a new massive kilt pin for the warrior in us all - Fenrir. In Norse legend, Fenrir (or Fenris) was the great primordial wolf. A force of chaos, he was an even match in battle to any of the Gods, even Odin, who would eventually fall to him in the battle of Ragnarok. And yet, the power of Fenrir has become a favorite theme in Nordic art. To the Vikings, the wolf symbolized an indomitable will to survive and the refusal to submit to one’s foes. If this sounds like you, then this is your kilt pin. The design, conceived by an American artist of Celtic & Norse heritage, combines the very best of ancient as well as contemporary art. Our UK-based craftsmen form high-quality pewter into swirling Celto-Norse knotwork. The head of Fenris is rendered in energetic modern style - you can almost hear his jaws snapping. Not for the meek -- this over-sized, rugged kilt pin measures a full 2" wide x 4" tall! It can do double duty as a brooch for a woman's shawl or sash!